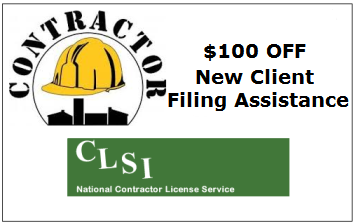 Free Quote - Contractorï¿½s License Filing Service ï¿½ Save Money! Get a Free Contractor's License Quote for our Contractor License Application Filing Service - "NO CREDIT CARD NECESSARY" | To provide you with the Best Contrator's License Filing Service for a specific State Contractors License. Please answer just a few questions about the type of contractor license you seek to obtain. One of our Support Staff will contact you with the filing service cost and the process. MONEY IS TIME and Our Service will Save You Both. Please call us with any questions you have:(505) 452-8311 Thank you. For which state are you interested in obtaining a Contractor's License? Which state is the business registered? If you do not wish to be contacted by email, please enter "none"